The initial introduction chapter I think is a bit long winded in its discussion of comparing Benedict Anderson and his work called Imagined Communities, as well as, on David Henley's writing. However once you get past that, the author brings it back to how it relates to southeast Asia and specifically Laos. Instead, the aim of the book is to discuss how a specific idea about Laos and its culture was formed with reference to divergent discourses on Laos and the Lao. p.27 - We all know the major Lao kingdoms of Luangprabang, Vientiane and Champassak. However, "besides these three kingdoms located in the Mekong valley, the geopolitical map of what was to become Laos was made up by smaller kingdoms like the Phyan Kingdom in Xiengkhuang and a group of smaller chiefdoms like Huaphan and Sipsong Chuthai situated between the Mekong Valley and the Annamese Cordillera. 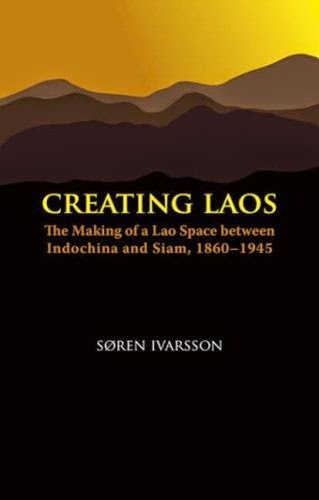 p.69 - A map showing how back in the 1920s and 1930s Laos did not even appear in Thai literature. They essentially treated it as their own Thai territory even though at the time the Kingdom of Lanxang still existed. p.83 - Fascinating section on how Lao territory is lost or "returned" to Thailand and how France reluctantly agrees to it in part because of the irredendentist movement in Thailand and facing a war against Germany. p.100 - Another fascinating section. This one is on how the Vietnamese play into Lao politics and population and how it began. In short, it was because the French brought them in to work in government posts and because they spoke French. The writer also paints an interesting picture of how this was simply normal within the realm of Laos being a part of French Indochina. Within this section, there's also a startling discussion on how some French politicians wanted Laos to be completely colonized by the Vietnamese who they believed were seen as being more industrial than the Lao. And that by doing this, cities would grow and agricultural output would increase. Their plan would have been to move Vietnamese people in by the thousands throughout several cities and to literally supplant Lao people from their own land so that they would become a minority. However these idea, fortunately, were repulsed by other French politicians of the time as well as by Lao Prince Phetsarath. They argued back saying that such a plan would backfire and would cause great harm to Lao people. Furthermore, resistance movements in Vietnam were springing up. This worked in Laos' favor. A new argument was put forward suggesting the Lao were more loyal and peaceful and such resistance would not spring forth unless Vietnamese were brought in. Furthermore, as it turned out, even though roads were created linking Laos and Vietnam, the Vietnamese did not come in groves to Laos. p.111 - Section on how writing Laos' national history, its challenges and politics that play into it. p.127 - Discusses how Lao language becomes politicized and separated from its neighbors purposely, both for practical reasons and also for nationalistic reasons. Another incredible interesting section to read! I could go on with all the fascinating details of this book but I'll stop myself. I'll end with saying that reading this book was a good learning exercise and it acted as a reminder. Why? Because we sometimes forget that Laos, though historically quite old if we take into account the Kingdom of Lan Xang from Chao Fa Ngum's period in the 1300s, is still a young country by modern nation standards, as the Lao PDR was only established in 1975. Much of what we think of modern day Laos and Lao culture is often based on very recent modern history. This book reminds us of some of those forgotten details of Lao identity and history and how certain elements came to be. If what I wrote interests you, then definitely pick up a copy of this book. At the time of this writing, there's a sale price of $13USD on Amazon.com. Highly recommended reading. For those who might be interested, I've included the full table of contents below.